An Innovative New SoftClouds IoT-CRM solution for the automotive industry is giving new meaning to the term Information Superhighway. 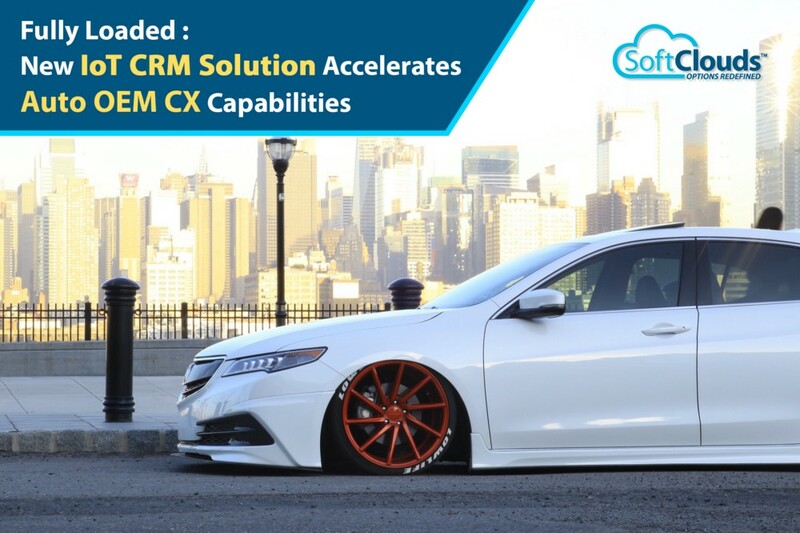 The SoftClouds breakthrough merges Telematics & IoT with Oracle Siebel CRM to provide automotive OEMs with the capabilities necessary to design finely-tailored customer experiences. Benefits of the new solution include increased customer satisfaction, proactive monitoring of vehicles to quickly address product quality and service issues, and new opportunities for OEMs to target customers with highly personalized and timely marketing offers. The vehicles of today have become the ultimate mobile devices. Equipped with an abundance of advanced technologies such as Sensors, GPS and Bluetooth, they are supercomputers which can analyze both internal systems and the external environment, then quickly interact with OEMs to solve problems and smooth a customer's journey. Given the promise and prevalence of such technologies, drivers now expect their customer experience to be high-tech and high-efficiency. 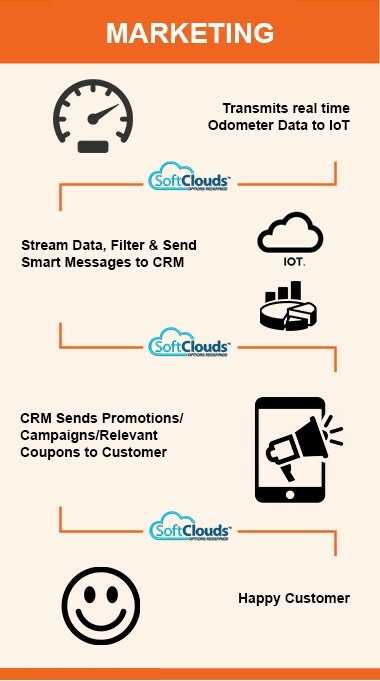 The SoftClouds solution makes this a reality by allowing OEMs to magnify CX capabilities by leveraging data collected from a wide range of sources, including Enterprise Systems like Siebel, Cloud and Big Data, as well as Mobile and IoT Information pools. In the process, customer service becomes customized service — uniquely fashioned for each consumer and delivered promptly, at the most convenient time. The key to this is device monitoring, made possible by SoftClouds' integration of Oracle IoT with Siebel. As a driver cruises contentedly down the highway, the SoftClouds solution analyzes a constant stream of data, then takes appropriate action when warranted. Interventions may range from sending messages to the OEM to taking control of particular systems. The SoftClouds innovation is a next-generation example of the IoT applications that are already making headlines in the automotive media, such as Google's self-driving car, Tesla's auto pilot, General Motors' OnStar Smart Driver, and even the newest locomotive design from General Electric. By anticipating problems and calculating timely solutions, the SoftClouds solution puts the customer at the center of an OEM's business model. A connected vehicle maximizes consumer-focused strategies, and makes possible an array of benefits for both driver and company. Late at night, a small puncture develops in a tire as a driver is passing through an unfamiliar region. The SoftClouds IoT solution immediately detects deflation in the tire and alerts a call center, allowing a representative to call or message the driver with information about nearby towing services, and assist in other vital ways. By monitoring the odometer of the vehicle, the system allows a company to send tailored messages suggesting it is time for an oil change, tire rotation or new tires, a warranty extension, or even a new vehicle. Data collection makes possible ultra-targeted messages, including individual pricing for vehicles and equipment, sales promotions, and lead generation. Today the average car buyer relies on data from companies such as Carfax, Kelley Blue Book and TrueCar to learn the history and value of a vehicle. The SoftClouds solution promises to revolutionize purchasing by enabling information to be gathered directly from each vehicle. IoT-enabled cars can communicate real-time data, giving detailed reports on the condition of a vehicle and even information that reveals whether it is being responsibly driven by the owner, which is relevant to estimating the true value of the car. The SoftClouds system's ongoing monitoring of a vehicle allows product quality engineers to benefit from a stream of data that enables them to identify safety issues on a macro or micro scale. The data collected from millions of cars make it possible to isolate patterns that could indicate equipment or systems are about to fail. Such valuable information allows product quality engineers to warn a particular driver, and also to make fleet-wide changes in a vehicle's design or the processes used to manufacture it. This kind of data trove would have been invaluable in identifying and remedying some of the most infamous design failures of the recent past, such as the Ford Explorer rollover issue and the General Motors faulty ignition switch. Most importantly, consumers could have been warned of these hazards at a very early stage. As you'll notice from many of these examples, the SoftClouds system performs many tasks without the need for human intervention. When it's time for a CRM representative, product quality engineer, or other key employee to know about an issue, the system communicates the data quickly and efficiently to relevant personnel. And because most of this is happening before the driver is aware of a problem, an automotive OEM using the SoftClouds system seems to the consumer to be proactive, efficient — and completely focused on his or her total satisfaction. The road ahead for the automobile industry leads directly to personalized customer experiences that will improve owner satisfaction, boost OEM sales, identify potential service issues, and provide for a seamless, efficient system to address every problem. In short, better connectivity leads to better CX. It is clear that business success will become increasingly correlated with the Automotive OEM's devotion to promoting consumer-focused, uniquely tailored experiences for prospective and existing customers. The key to the ideal business model of the future is ready access to data — made possible by IoT connectivity and leveraged by efficient CRM — enabling smart decisions by companies and drivers alike. Can you think of other ways IoT-enabled monitoring of vehicles might be used to benefit consumers, companies or even public safety? Is this technology something you could apply to your own business to magnify efficiency and customer satisfaction? We'd enjoy hearing your thoughts.